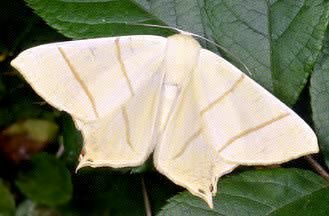 The Swallow-tailed Moth (Ourapteryx sambucaria) is a moth of the family Geometridae. This is a large (wingspan 50–62 mm), impressive moth, remarkably butterfly-like. All parts of the adult are bright white marked with faint buffish fascia. The species gets its common name from pointed projections on the termen of the hindwing with brownish spots at their base. It flies at night in June and July and is attracted to light, sometimes in large numbers. The brown, twig-like larva feeds on a variety of trees and shrubs including elder, hawthorn, honeysuckle and ivy . The species overwinters as a larva. It is a common species across Europe and the Near East.